FRANKFORT, Ky. — Northern Kentucky University students rallied at the state capitol Monday for more funding for all public universities. 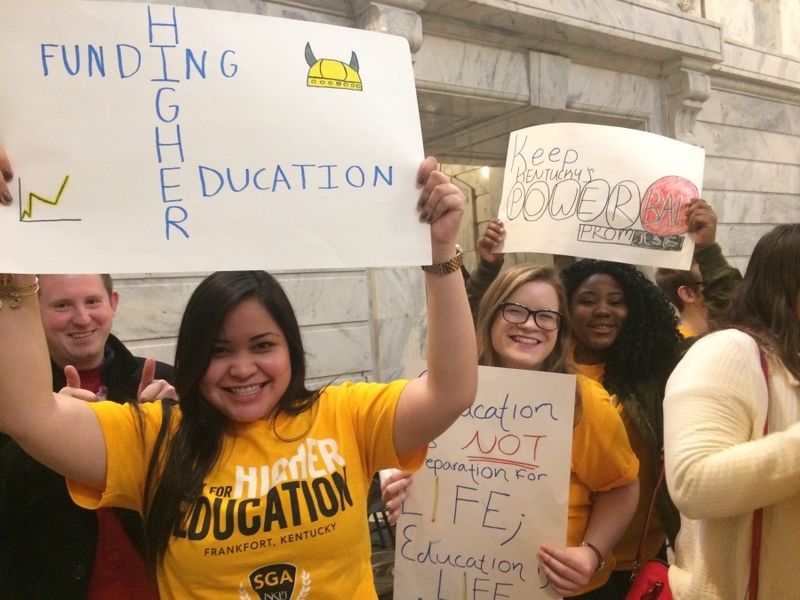 Students from Murray State, Western Kentucky University Kentucky University, Eastern Kentucky University, University of Louisville and other state schools convened to protest and petition against increased cuts in funding. 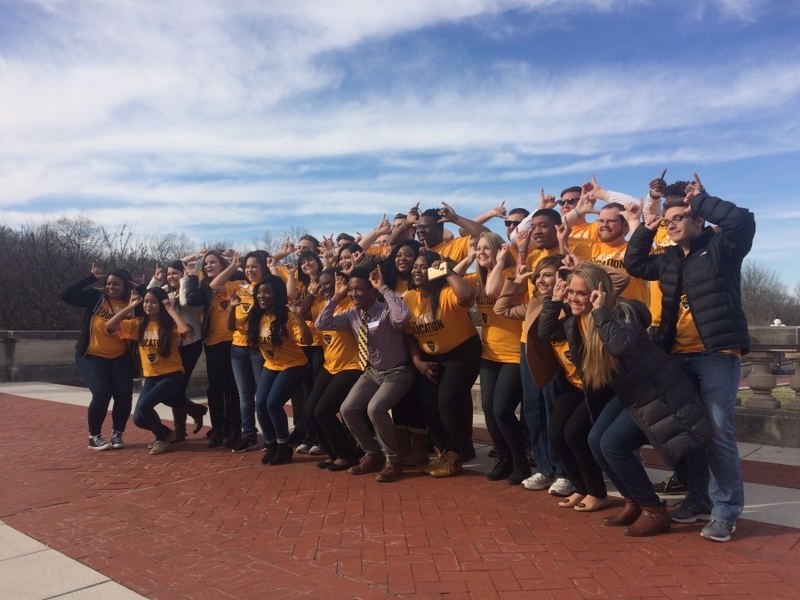 Nearly 30 members of NKU’s Student Government Association gathered at the Rally for Higher Education in an effort to prevent cuts to the state’s higher education budget. The Rally for Higher Education was hosted by Murray State’s Student Government Association and sponsored by the Kentucky Board of Student Body Presidents, which sent a petition to the governor and state legislature titled “Defend Kentucky Higher Education” last month. Student speakers attending the rally were NKU SGA Secretary of Public Relations Sami Dada and SGA Senator Hannah Edelen. Dada, a junior communication studies major, told of his family’s struggle immigrating from Liberia to the U.S.. Dada said the obstacles of being a lower-income family made life difficult. He said he is thankful for the needs-based scholarships that have allowed him to be the first person in his family to attend college. 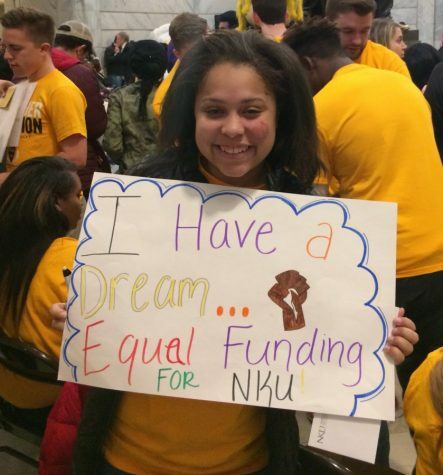 NKU SGA member Janiah Miller holds her MLK-inspired sign. For freshman Edelen, affording college required hard work academically and financially. Edelen said she had to work 20 hours a week as a high school junior after her mother was diagnosed with cancer, all while studying hard to raise her ACT score and get into Kentucky’s Governor’s Scholars Program. “I paid for my own college because I knew my family couldn’t do it for me,” Edelen said. Despite her economic situation, Edelen said she found hope through education and a teacher that encouraged her to achieve her goals. Other student speakers included one of the event’s organizers, Murray State Residential College Association President Carter Hearne. Hearne said that united students can influence state policy makers. Several lawmakers appeared at the rally to show support for increased education spending. Kentucky Sec. of State Alison Lundergan Grimes and Atty. Gen. Andy Beshear both spoke with students against furthering education cuts. Beshear also discussed winning lawsuits against Gov. Matt Bevin’s budget cuts and believes everybody in Kentucky should receive the opportunity to go to college. The Northerner reported last year on the goal of NKU president Geoffrey Mearns to implement outcomes-based funding. According to NKU research, state appropriations made up only 28 percent of the school’s budget. The state legislature and Gov. Bevin recognized NKU is underfunded and pledged an additional $5.33 million for 2017. SGA members went to the capitol to rally for higher funding. After the rally, NKU student body president Will Weber delivered handwritten letters to Gov. Bevin’s office. The letters, written by NKU students at the rally, addressed reasons why public universities deserve more funding. Kayla Lowe, an NKU alumni, said she wants her alma mater to receive the amount of funding and recognition from lawmakers it deserves. Edelen said she believes all Kentucky citizens should have the opportunity for postsecondary education, no matter their background. Even if current NKU students will not reap the benefits of future scholarships, Dada said it is important that funding helps NKU grow. He compared the value of building young minds to the value of building bridges. A previous version of the story listed Carter Hearne as the Murray State SGA president. His title is Murray State Residential College Association President.